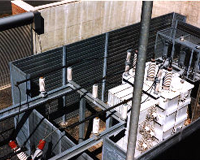 Noise control barriers for: cooling towers; HVAC condensers and chillers. 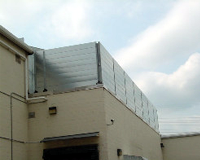 A neighbor’s concern about noise from a hospital’s Cooling Tower was resolved with an 8’ high x 99’ long modular acoustical barrier. Bracing which is not normally required, was added because of the roof mounting. The barrier was also powder coated on both sides to add a nicer appearance for the patients as well as the neighbors. Noise from several sources on a plant roof was disturbing nearby homeowners. The problem was resolved with an acoustical barrier wall. One leg of this 8′ high, “L-Shaped” barrier, is 12′ wide and the long leg is 67′. 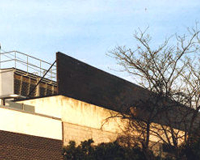 The wall not only provides the required reduction at the Property Line, it also serves as a “sight-barrier” for the equpment distributed at various locations on the plant roof. A major pharmaceutical company had a serious neighbor complaint about the noise from the two transformers on their site. This open, modular acoustical panel barrier was designed with clearance for the wiring and with a labyrinth for access to avoid any doors which are a safety hazard around high-voltage equipment. 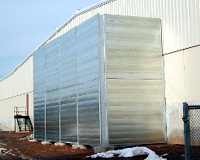 This “L-Shaped” 10’ x 40’ x 20’ high acoustical barrier was used to shield noise from the air intakes for the high pressure blowers at a glass tempering facility. The open top and one end allows adequate air supply for the blowers while shielding the neighbors from the noise.